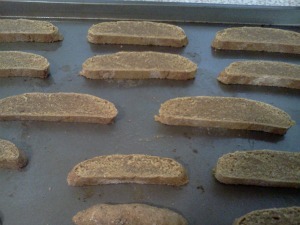 Pumpkin Biscotti Recipe - A traditional Italian cookie is made dog safe, and tasty, just for your little one. 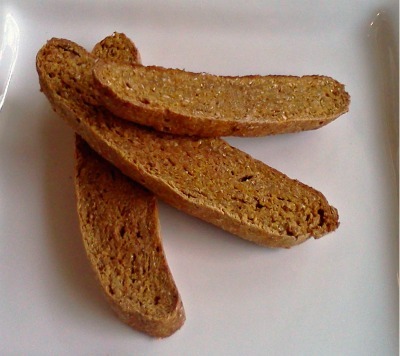 We used pure pumpkin puree to make this biscotti a seasonal favorite. 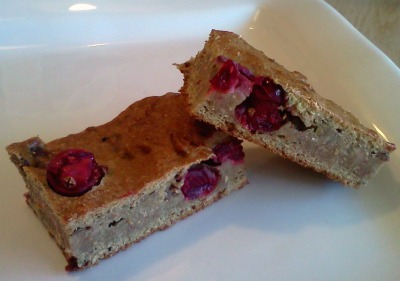 View the full recipe on the link above. The pictures and tips below are exclusive to our newsletter subscribers. A new feature of our quarterly newsletters is more photos! 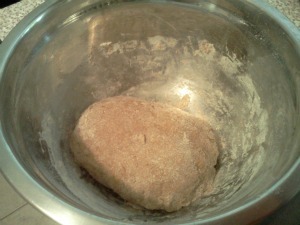 We hope these exclusive pictures will help give you the confidence to make your own homemade dog treats. 2. 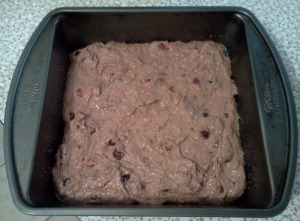 This is a photo before the first baking time. 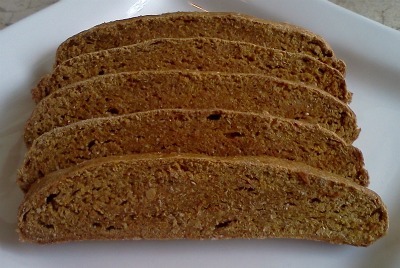 You want an even loaf about an inch thick. 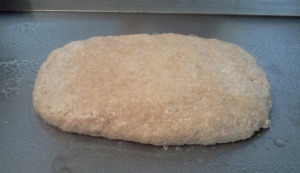 Work with the ball of dough to get it as even and rectangular as possible. 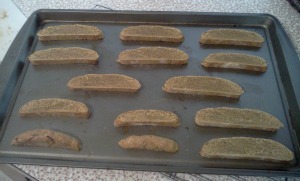 The more even the size, the more even the baking and sizing of your individual biscotti dog treats will be. 3. After you've baked your loaf, and it has had a chance to cool, you'll need to slice the biscotti. We prefer a nice thick slice of cookie, so we chose 1/2 inch thickness. If you have large breed dogs, you may want to make the slices a little thicker. However, if you change the dimensions, be aware that you will need to adjust the baking time. Plus, you will get fewer individual treats from each loaf. 4. After your slices are cut, place them cut side down on your baking sheet. 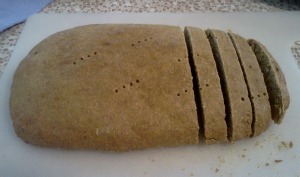 The outer crust of the biscotti will be firm, but the inside will still be very moist. You can still see the color difference of the baked outer and soft center in the pictures below. To all my fellow dog treat bakers, I just want to say Thanks. As most of you know, it's just me and my husband behind the website Dog Treat Kitchen.com and I have enjoyed another wonderful year of getting to know you and your sweet dogs. It brings a smile to my face and a warmth to my heart to know that your dogs are loving my recipes. When we started, I never imagined I'd have a hand in filling so many doggie tummies with delicious and nutritious homemade treats. I also want to thank all of you who have purchased the book on How to Start Your Own Dog Bakery Business. I believe we all should be able to turn our passions into a profitable business. Since all of the recipes on our site are free to you, I'd like to ask a favor. If you plan on making any dog gift purchases, or any purchases through Amazon, please consider starting through my website. This will allow me to continue providing the best free dog treat recipes, with pictures, that can be found on the internet. It's easy to do, and will cost you absolutely nothing. Just start by clicking this link to Amazon.com. Then go about shopping for new dog toys, dog beds, dog treat ingredients or anything else that you would normally shop for. You can also bookmark this link for any future shopping you are going to do through Amazon. Thank you so much for continuing to use our site to treat your dog to the very best treats there are, homemade dog treats that you make with love. 2. The dough will be very thick. You'll need to spoon it into the prepared pan. 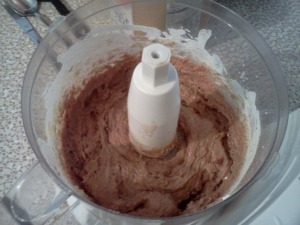 Then you can gently spread it out to the entire pan. It will still be very pink in color before it's baked. "I just wanted to comment on the layout and how simple your site is, and easy to navigate around. The tips and ideas all are great, and I look forward to trying out some of the yummy treats for my girls." "I have made the pumpkin and clove muffins for my "kids" as well as several co-workers' four-legged friends. They are a hit. 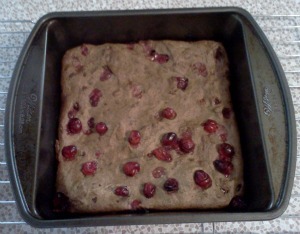 Everybody loves them and won't let their "parents" hold back - if they smell 'em, they want 'em! Thanks so much!" What's New for the March Quarterly Issue? We're finally adding PIZZA to our long list of dog treat recipes! :) The yummiest toppings, how to serve and bake the best pizza dog treats ever. We're also featuring a warm and delicious human favorite, made especially for your dog. Banana Bread!